Summer. In. A. Jar. The local strawberry season is too short; just six weeks long. Have you ever wanted to capture the smell and flavor of a just-picked, warm, lusciously ripe strawberry? If so, try making a jar of this oven-roasted strawberry and rosemary jam with a touch of lemon juice or balsamic vinegar. This recipe was given to me by my friend, Malinda Hersch, Program Director at The Nashville Food Project. Malinda made it for TNFP’s Patron’s Party gift baskets. The idea for this post started when I read in Edible Nashville, a gorgeous publication on local food trends, that the first Tennessee strawberries were coming in. On a whim, I emailed Hank Delvin at Delvin Farms to see if his strawberry crop was ripe. He said they were getting ready to pick that morning and invited me to join them. I love driving out to Delvin Farms in College Grove. It’s a beautiful drive, and I know I’ll always learn something new about organic farming practices from Hank or his dad. Check out this post from last year when I chronicled a morning spent gleaning vegetables for TNFP at Delvin Farms. The most interesting tidbit I learned on this visit was the concept of incomplete pollination. Like for many of you, I’ve seen the results of incomplete pollination, misshapen berries like the ones in the picture below, I just didn’t know there was a name for it — or a reason. Some misshapen berries are lovely! Hank plants new June-bearing strawberry plants in long rows of plastic-covered raised beds every September. The plants go dormant in the winter and start growing again in the spring. The plastic keeps the weeds out and helps to warm the soil in the early spring. Once the delicate flowers start blooming, it is imperative that the blooms be protected from frost. To this end, whenever the temperature dips, Hank’s staff has to cover each row of strawberries with agricultural cloth. This past spring there were six frosts in the three weeks preceding the first harvest. Strawberries are considered self-pollinators, and as such, their male and female parts are on the same flower. It takes gravity, the wind, rain, and insect pollinators to move the pollen across the flower to pollinate it. If the plants are covered, the wind and bees can’t do their part, thus, a higher incidence of incomplete pollination. I was amazed to see the plants’ leaves waving in the wind, a wind I couldn’t even feel. Pistils and stamens. Remember them? The strawberry flower is not your typical flower. Yes, it has the male parts which are the yellow pollen coated anthers known as stamens. And it has the female part called an ovule that connects to an ovary and collectively is known as the pistil. However, whereas most flowers only have one pistil, the strawberry is an aggregate fruit and has as many as 500 spike-like ovules, each one an immature egg needing to be pollinated so it can produce seed. The more of those ovules that get pollinated, the bigger, puffier, and more perfect the strawberry. 4 bushy sprigs fresh rosemary (1/2 ounce). Clean and hull two quarts of strawberries. Figure on four cups of berries per quart container. Slice berries into lengthwise quarters. Add strawberries and sugar to a mixing bowl, stir and allow to macerate, which means to break down and soften. Allow berries to macerate for two hours, or up to 24 hours, stirring regularly to re-incorporate the sugar that sinks to the bottom. Don’t skip this step. It’s what helps the berry chunks to keep their shape. Squeeze the juice out from one large lemon and set aside. Pour the macerated strawberries and lemon juice or vinegar into a saucepan. Bring to a full rolling boil over high heat watching carefully, so the juice doesn’t boil over. A rolling boil is one that doesn’t stop boiling when you stir it. Once the mixture reaches a full boil, reduce the heat and simmer uncovered for ten minutes. About five minutes into the cooking time, add the rosemary sprigs, stir, and continue to simmer. The lemon juice and vinegar are acids and when heated help release the pectin in berries. Pectin is a gum-like substance that is needed to “set” jams and jellies. It occurs naturally in fruits, but more can be added in the form of powder if a faster set is desired. For more on pectin, read my posts about making grape jelly and crabapple jelly. Now it is time to roast the berries. Preheat oven to 150º. If your oven’s lowest temperature setting is a little higher than that, that is fine. You could even set the oven to convection roast and cook it in half the time, but I prefer the slow cook method. Pour the mixture, including the rosemary, into a 13″ by 18″ baking pan. Place pan on the middle oven shelf and roast for 10 hours, or until the syrup is thickened and has a gel-like appearance. I often put it in the oven at bedtime and take it out the next morning. How to test hot jelly for gel formation: Use a chilled wooden spoon to scoop up the preserves. Allow to cool and then tilt the spoon, so jam starts to drips. If the drips form a triangle-shaped thick flake, it is ready. Don’t get too hung up here with the testing. After 10 hours, assume it is going to be great! 3) freeze in plastic containers. I love the combination of strawberries, sugar, and balsamic vinegar, so I often substitute four tablespoons of balsamic vinegar for the lemon juice. The vinegar not only flavors the jam, but it gives it a smoother, earthier taste than the lemon juice. 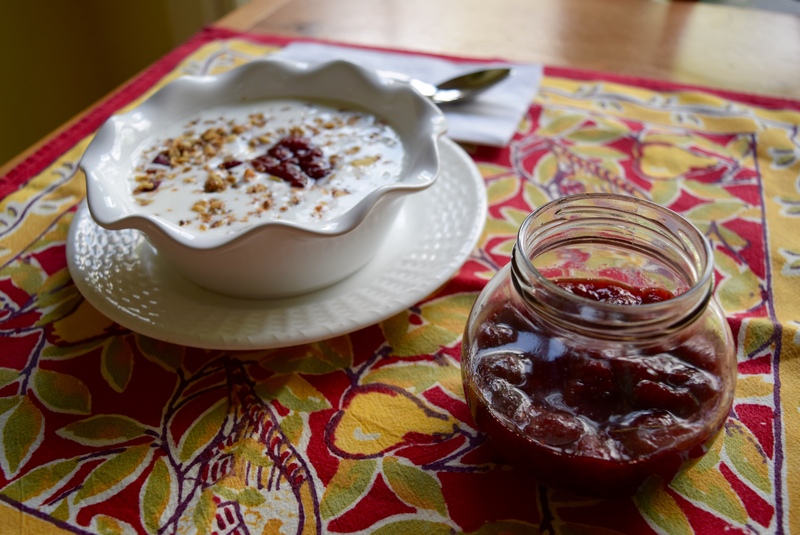 This jam is great spooned over @judyschickens granola and plain, low-fat yogurt. The Nashville Food Project brings people together to grow, cook and share nourishing food, with the goals of cultivating community and alleviating hunger in our city. Their primary fundraising event, Nourish, will take place on Thursday, July 20th this year in the gorgeous dining hall at Montgomery Bell Academy. Wow, now this is a recipe I need to try! Thank you for sharing! I love getting your blog! It was great to see you and Kelly in Richmond. Hope to see you next year . PS Check out this post: https://judyschickens.org/2015/12/12/mrs-walkers-cranberry-pie/ It’s a recipe for cranberry pie I got from Mrs. Walke in the Seventies. There are also some pictures from our cottage in Bay View in the smae post. This sounds heavenly! Must try. I used to pick strawberries in the back yard at 2300 Hampton where my grandfather, W.A. Bass, had a big garden. A tedious job but to my mind there’s nothing better than TN strawberries. The Strawberry Festival in Plant City, FL, could not match them. Ditto Fl tomatoes v. TN tomatoes. I guess TN just has better dirt! Judy, this is the best jam I have ever tasted! Thank you for the jam and now the recipe! Thanks, Mary! I’m going to save some of the new batch I made today with the balsamic vinegar so you can see which one you like better. Hope to see you soon. Hi, I met you at AZ Kelley when you came to share your chicken. (I’m across the hall from Grace). Love this strawberry jam recipe. I am definitely going to have to try it this year……maybe this weekend. Strawberry season is coming soon in Portland, Oregon, and I will be making this jam! With balsamic, I think. This looks so good! Definitely do the balsamic. It is so good. I give everyone that comes over a spoonful so we can all gush together. My next strawberry food will be a strawberry cake. Do you have a good recipe for that? Enjoy your strawberries! No strawberry cake recipes here, but if I run across one I’ll let you know! Mmmm, strawberries. I love Nigela, too! Have a nice weekend, Kat and thanks for the shout out!! PS, when there’s not much else to make for lunch in the fridge, there’s always the strawberry jam and almond butter for a nice PB&J sandwich. My fave!